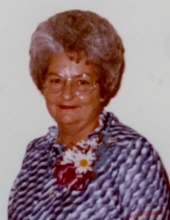 June Hunt went to be with the Lord and family on April 4, 2019. She was born Dosia June Hall on November 8, 1928 in Byars, OK to George and Ida Hall. She married Phil Hunt on April 14, 1945 in Carlsbad, NM. Together they lived in various places until they finally made their home together in Newalla, OK in 1963 with their three children. June was a homemaker and eventually developed a love for doing ceramics which she turned into a business career. She also had a passion for porcelain dolls as well. June’s hobbies included camping and attending CB radio rallies with her husband, Phil, just to name a few. June is preceded in death by her husband, Phil; her Mother and Father; four siblings and a son, Jim Hunt. She is survived by her daughter, Ann Pritchard; son, Jerry Hunt; six grandchildren and numerous great-grandchildren. To send flowers or a remembrance gift to the family of June Hunt, please visit our Tribute Store. "Email Address" would like to share the life celebration of June Hunt. Click on the "link" to go to share a favorite memory or leave a condolence message for the family.